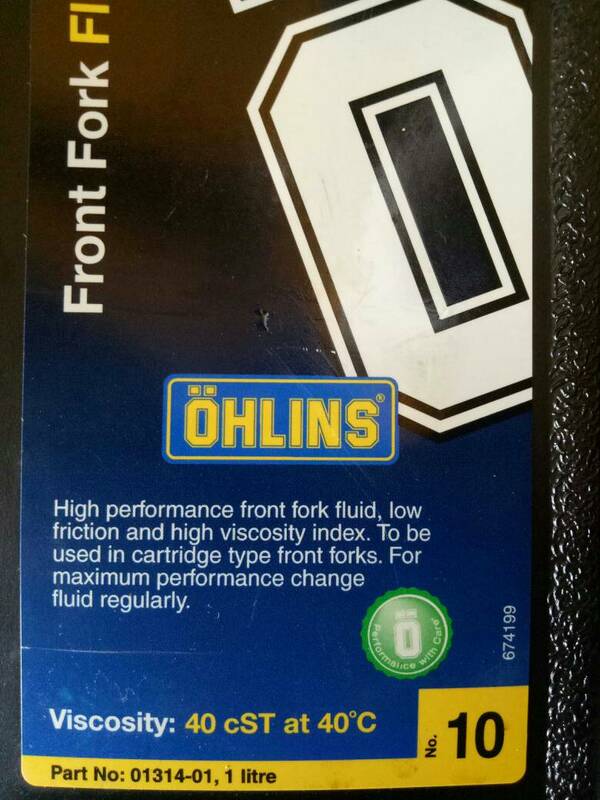 Thanks yes found it...strange thing is i measured all the fork oil and got 1250mils figured i lost say 50mils..so thats 650mils per fork...but the volume stated in the manual says 600mils...also still unsure of oil weight as it says 7.5/10/15/20...take your pic i guess ? Any recommendations? If you respect your teeth, go with a lower viscosity. I use Bel Ray synthetic 5W and its still pretty firm. Hi again...what weight ohlins did you use? Maybe we are looking at different pics but the one I see says No. 10. Do some homework to pick what's best for you if you are moving from what the bike manufacturer recommends. A problem with fork oil is there is no universal standard and the weight numbers are not transferable between the different oil producers. There are some big differences in the flow and therefore the responses you will get. This is only one reference. Take a look and you'll find more. BBob and BP6666VR like this.